Regarding our rejection and condemnation of the dictatorship regime’s interim constitution. The National Council for Peace and Order (NCPO) – the title the May 2014 Thai coup-makers bestowed on themselves – received from the King, on July 22nd, a document they’ve called the 2014 interim constitution. In order to do so the NCPO has exercised power by stealing the people’s sovereignty and illegally enforcing itself as the highest law in Thailand. The FT-HD wants to make it clear that NCPO is a criminal organisation that has committed outrageous wrongdoing and which has sought to intentionally destroy democracy. The NCPO claimed that it seized power in order to solve the country’s problems and return “happiness” to the Thai people but, all along, it was aware of and taking part in a plot to topple the democratically-elected government. Therefore it has no legal rights and legitimacy to give any kind of orders as if it were Thailand’s head of state. The Thai people have no legal duty to abide by this “interim constitution”. We want to affirm that we will not accept the NCPO’s power which comes via both physically enforcement and intimidation and we ask those who support democracy to stand with us in firm unity. The contents of each section-including section 48-of the Royally-endorsed interim constitution, contradicts basic democratic principles. Overall, it is a document created in order to serve a small group of people in Thailand which includes the network of the establishment and the privileged. The interim constitution dismisses 65 million people and treats them as if they are subordinates who can be arbitrarily ordered by the ruler. This dictatorship-mindset appears in the entire interim constitution and it is evident that the establishment-network which ordered the coup has completely abandoned democracy. The ongoing-conflict is deeply rooted in Thai society and primarily derives from this backward establishment mindset so nobody should be fooled by the coup makers and the NCPO’s propaganda. 1. Section 35 is intentionally laid down by Thai dictator in order to potentially create a permanent monopoly of power. This section aims to destroy any opportunity for Thai society to return to a stable democratic system. It destroys the political party system and any majority in the parliament is dismissed as being sovereign as the constitutional court would be given excessive power and allowed to destroy the election mechanism at anytime. It also gives huge powers to the Election Commissioner to make final decision as to who violated the law regarding vote buying and it has power to ban that person from political activity forever. Without any democrat oversight this could easily lead to persecution and the curtailment of political rights. In short, this section aims to destroy the people’s opportunity to vote for the political party of their choice. 2. Section 38 grants power to repeatedly draft a new constitution over and over, without any timeframe, until they find one that fits their purpose the best. It is similar to what happened during the military dictatorship of Field Marshal Sarit Thanarat and Field Marshal Thanom Kittikachorn during the 1950s and 60s-then it took 12 years to finish drafting the constitution. The coup makers and the establishment network can use this section as a pretext to delay the constitution drafting process as long as they want. As we at the FT-HD have warned the point of the coup is to seize power and dominate Thailand for a period of time until they are certain that ordinary Thai people will not be able to stand up and make demands again. 3. Section 44 is not much different from section 17 of Field Marshal Sarit Thanarat’s constitution as this section gives unlimited and absolute power to the coup makers, who, ultimately rely on the of use force to seize power. It grants impunity for them and whoever colludes with them, so completely and utterly they can never be held to account for their crimes. This section is shameful and reduces the dignity of Thailand and its people. 4. This document grants huge power to governmental officers as it allows them to hold political positions. The principle that Thai people should be in control of the direction of the state and its officers is destroyed immediately. From now on, we might see governmental officers using power to intimidate Thai citizens. It will take Thailand backwards to a past when governmental officers held power over and above the taxpayers and citizens who pay for their work. Such unaccountable power is as at the centre of the dictatorship regime’s nature. The FT-HD and its supporters believe that regulations regarding the rights and freedoms of the Thai people as they appear in this interim constitution are completely meaningless as the document grants overbearing power to the authorities, allows them to dominate the whole system. We affirm that the coup makers and its dictatorship network is an enemy of the Thai people and their rights and freedom. The NCPO have announced repeatedly that they seized power illegally because they wanted to begin a “political reform” process to “reduce conflict. However it has become evident that the interim constitution is setting out to establish a dictatorship in order to curtail people’s power and destroy the election process completely. It should be noted that there is nothing in the interim constitution that talks about reforming the court, the judiciary power, the so-called “independent organs”, the bureaucracy and even the army itself, all of which are key elements in exacerbating Thailand’s political problems over the last decade. These elements have all used illegal power to force the people into the direction they want and have used weapons to suppress the people. We want to condemn the document called “the 2014 interim constitution” which has been produced by the coup makers as it is an illegal document which seeks to destroy democracy. In the coming days and weeks the FT-HD will present the People’s Constitution in order to return democracy and sovereignty to the Thai people. Meanwhile, Thais and foreigners who support democracy should continue to protest against illegal power of the NCPO by distributing the FT-HD’s symbol whenever the opportunity allows in order to show that those who support democracy still exist and are ready to stand up to the establishment. Statement issued on Friday, July 25, 2014. It is now tragically evident that Thailand has returned, once again, to a vicious cycle of absolute dictatorial governance. The military junta regime that enacted this – in the name of the National Council for Peace and Order (NCPO) led by the Army chief, Gen. Prayuth Chan-Ocha – has used force to seize power from a democratically-elected civilian government. 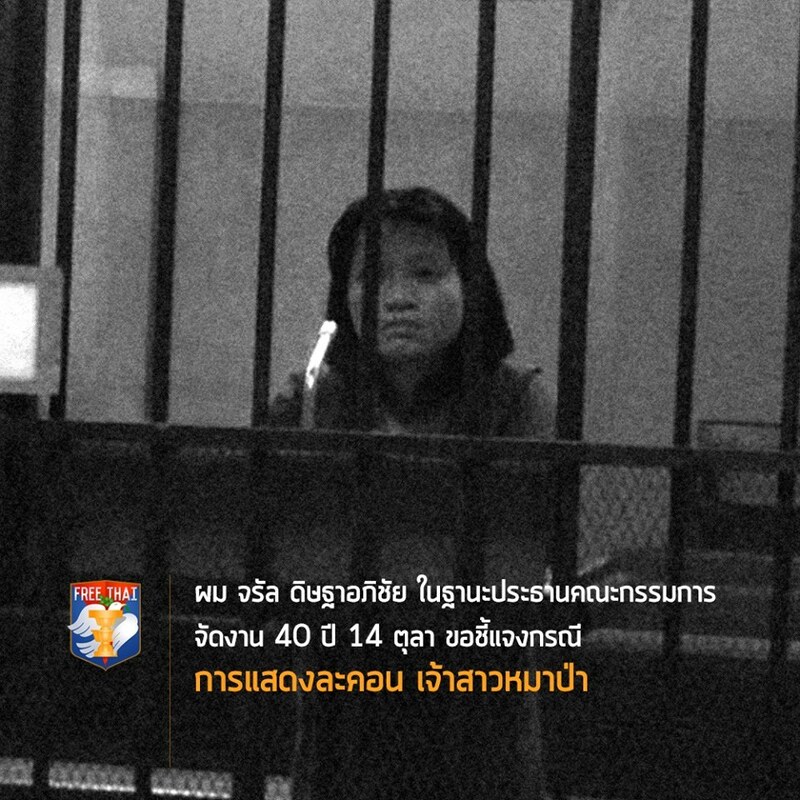 This is an outrageous act that has violated both Thai and international laws. It is clear that the junta’s actions are nothing but a grand larceny. What they have stolen, however, are your most precious sovereignty and fundamental rights that are legally guaranteed under democratic governance. It’s impossible to put a price on these rights because they are directly equivalent to basic human dignity – a treasure whose value is immeasurable. Moreover, the junta has violated the rule of law, abused democratic principles, and destroyed your rights, liberties, and human dignity. These are their most destructive crimes. The junta’s attempts to propagandise these criminal acts as legitimate are predictable – with their false promise to return “peace and order” – being nothing more than a deception wherein they attempt to rationalise and excuse their criminal actions. Their ultimate aim is to attempt to persuade ordinary Thai people to believe that dictatorship is superior to democracy. This game plan of demeaning and discrediting your sovereignty is one that has always been played out by Thai dictators and, as always, it has failed and will fail. We condemn all the arbitrary and repressive violations of the rights and liberty of Thais and foreigners by the Thai military regime and its allies in their continued attempts to turn Thailand into a “state of fear”. The military regime have also claimed that at some point they will transfer sovereign power back to civilian authorities. What they mean is that that will have created a new puppet structure whose sole purpose will be to re-entrench anti-democratic elements into Thailand’s body-politic and to sabotage the development of Thai democracy. Any such structure will need to be removed before a more democratic and civilised society can be built. On behalf of Thais worldwide who are committed to the principles of democracy and universal human rights, I hereby announce our complete and total refutation of the legitimacy of the military regime. The generals and their conspirators have no legitimate power whatsoever to govern the country’s economy and society. Furthermore, we will do everything in our power to prevent the re-entrenchment of anti-democratic elements in Thailand, to defend all forms of freedom, to demand respect in all forms of human rights, and to establish a full democracy as permanent pillar of Thai society. In order for Thais to establish a full democracy in which sovereign power lies fully with the people, we again completely refute the legitimacy of the Thai military regime and officially announce the establishment of the “Organisation of Free Thais for Human Rights and Democracy (FT-HD) on this day Tuesday, June 24th, 2014. 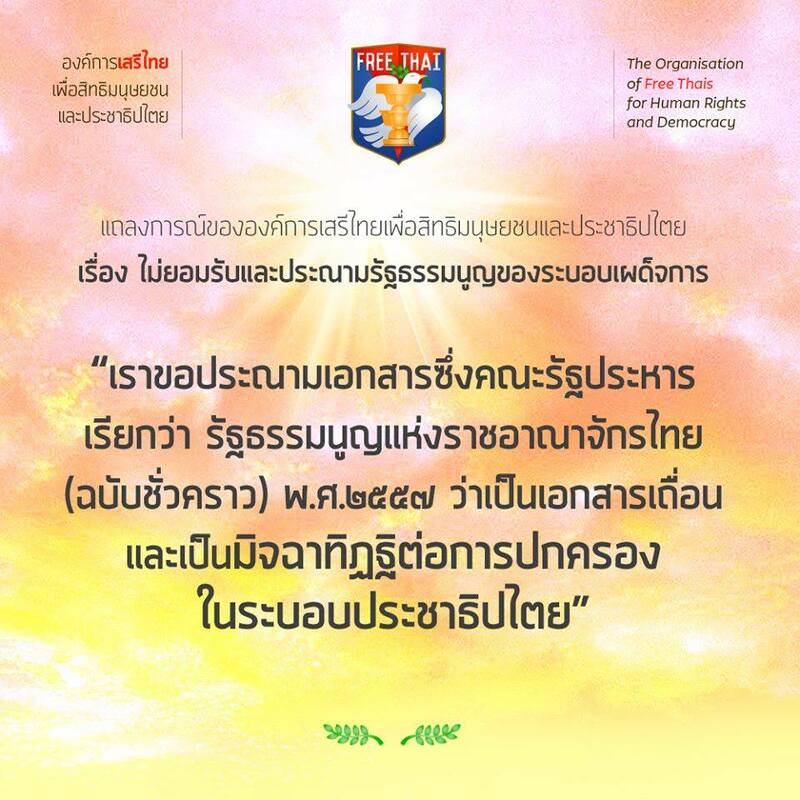 This organisation will now become the centre for all Thais who possess an unyielding desire for full democracy, in full compliance with the principles of democracy, universal human rights, international laws, and non-violence. 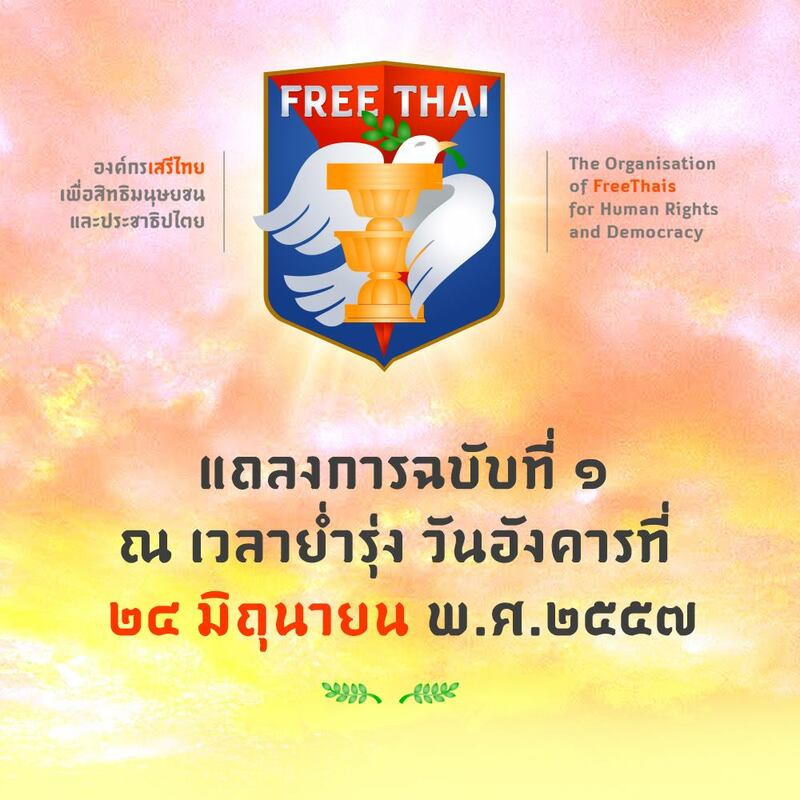 I hereby announce the establishment of the Organisation of Free Thais for Human Rights and Democracy (FT-HD). Our struggle will become possible when all groups and sectors work hard and actively together so that we can meet our common goals.